Posted Mar 05, 2019 by Eds. Question: What do you think about the U.S. plans to establish an illegal armed unit in Venezuela with a view to creating the same situation there as in Syria? Sergey Lavrov: We are certainly worried about the U.S. plans to arm militants in order to destabilise the situation in Venezuela and, frankly speaking, invade this sovereign country. The U.S. is not embarrassed to speak openly about it. According to incoming reports, the U.S. plans to buy small arms, mortars, portable air defence systems and a number of other types of weapons in an East European country, and move them closer to Venezuela by an airline of a regime that is the most, or rather absolutely obedient to Washington in the post-Soviet space. Naturally, we see these intentions. Many other countries, including Venezuela’s next door neighbours, see them, too. Brazil and Columbia, for one, announced their intention not to support plans for a military invasion of Venezuela in any way. If they keep their promise and firmly adhere to this position, the U.S. plans are unlikely to materialise. I hope the absolute, universal rejection of military scenarios by the world will cool down the hotheads in Washington, although some of them are truly unstoppable. But we will work on the basis of international law and demand that the U.S. respect the UN Charter. Question: How likely is direct U.S. military intervention in Venezuela? U.S. President Donald Trump has said, and his cabinet members have repeated, that all options are on the table. 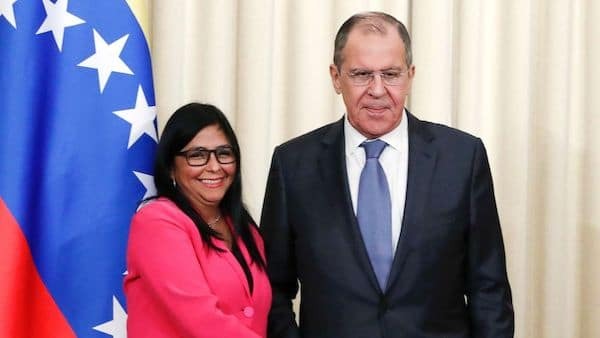 Sergey Lavrov: I have already said that there is no country, except one or two of the closest U.S. allies, that would support or allow military intervention in Venezuela. Everyone, including Venezuela’s neighbours, has already stated that they do not share or support this approach. Having said this, I should add that everything is possible, considering the current approaches of the U.S. administration. I cannot rule out that Washington may decide to once again act in a way that would violate all possible norms of international law. In addition, Elliott Abrams, who was appointed U.S. Special Representative for Venezuela, says directly that his responsibilities do not include searching for a peaceful solution but raising tensions and creating a situation that would provoke, as the U.S. wants, an explosion and bloodshed in Venezuela, and justify a military intervention. Nobody hides this fact in Washington. This is why I would like to repeat that I cannot rule out that these statements will serve as a prelude to such a reckless act. It is also evident that if Washington does act against the regional countries’ clearly stated policy in this situation and invades Venezuela, it will bring to light the true goals and motives of U.S. policy in Latin America. It is not about democracy, as they try to tell us, but about bringing everyone who disobeys to heel. The talk about how this is not just about Venezuela, and Cuba and Nicaragua will be next, is no coincidence. What if tomorrow someone else falls out with the U.S.? They will say the results of an election in the county do not meet democratic standards. I do not think that this position, which is clearly insulting to Latin American countries, will score Washington any points in the region. I am sure that in this case Latin Americans, who have healthy and long-standing democratic traditions as well as traditions of cooperation within regional organisations, will state their position explicitly, like most members of the international community. We hope very much that reason will prevail in the U.S. leadership.